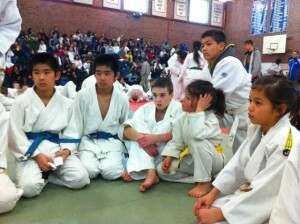 12 EBJI students represented the dojo at the Cupertino Judo Tournament on March 25, 2012. Representing the beginning kid’s class were Dominic Ho and Mike Myers, both 7 years old yellow belts. Dominic took first place in his division, winning all of his matches. Mike also did well by showcasing his combination techniques and won a match with osotogari for ippon. Representing the intermediate kid’s class were Albert Xing, Cole Filson and Taka Matsumoto. Albert went 1-1 to take second place in his division, throwing his opponent for ippon with osotogari. Cole was in stellar form winning all his matches by ippon to take first place. Taka also did well winning 3 matches to win second place in his division. Representing the advanced class were Masa Matsumoto, Sato Matsumoto, Nathan Canadas, Curtis Booth, Ashley Booth, Estefany Gonzalez and Nico Gonzalez. Sato and Curtis led the group taking first place in their respective divisions. Estefany and Nico each took second place while Ashley rounded out the medal count by taking third. Although they did not place, Masa and Nathan gain valuable competition experience for the future. Everyone competed showed vast improvement since the last tournament. Most importantly, everyone had fun and represented the dojo with great spirit and sportsmanship.